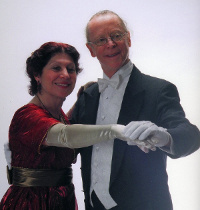 Our Dance Mistress and Master will be Arduina Alonzo and Michel Landry, organizers of English Country Dances in Montréal. Our dancers will be accompanied by Rufty-Tufty, a Montréal consort of four musicians: Suzanne Beauregard, Sally Campbell, Sarah Crawford and Sean McCutcheon. Click here to see the program for the ball.